When you’re pushed, killing’s as easy as breathing. Flashback to December 2006. Sylvester Stallone was about to release Rocky Balboa, the sixth installment about his signature, titular character. I’d seen the first film, and loved it; the original Rocky is a phenomenal story about real human emotions. I enjoyed the second, suffered through the third, turned the fourth off halfway through and to this day, I’ve never watched the fifth. The Rocky sequels are bad, if you want to describe them in one world. And the prospect of a sixth, with a visibly aged Stallone getting back in the ring, drew the collective giggles of the film-going world, including myself. But I saw the film, and in one word, it was phenomenal. I named it the best film of 2006, and I still believe that. 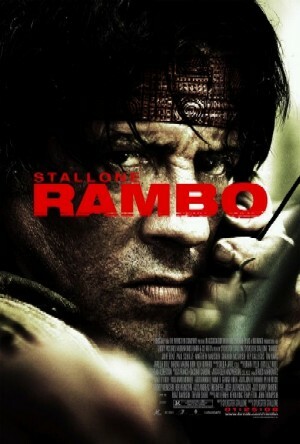 Shortly after the film’s release, Stallone showed a preview of his next film, a Rambo sequel, at Cannes Film Festival. Everyone knew he could pull off a sequel, even in his older age, and I don’t think many of us have been laughing too hard about the new Rambo film (except for its title). Does it deliver like Rocky Balboa did? In a way, yes. No, this is not something I’ll be naming the best film of the year, but it does for the character of John Rambo what Rocky 6 did for Balboa. It defines the character, showing a period of hardship in their later life where they finally come to terms with themselves. This is not as good a film as Rocky Balboa, but then again, the Rambo series never did reach the heights of the original Rocky film (though the Rambo sequels are much better than most of the Rocky sequels). But for what it is, Rambo is as much a character study with deep messages as it is a totally thrilling action flick. The plot sees Rambo living in Thailand as a snake wrangler. A group of young missionaries comes to talk to him about using his boat to get up river into Burma. Burma, as the film illustrates with some real-life documentary footage, is a war zone, and has been for 60 years (this plot element firmly cements Rambo in realism). But when the missionaries are kidnapped, and some of them brutally murdered, their boss (who runs a Church here in good ol’ Colorado) hires some mercenaries to get them back. He requests that Rambo be their guide, and the adventure begins. The film graphically illustrates what today’s world is like; the brutality the soldiers inflict on their prey is ruthless, but real. The missionaries, who berate Rambo for killing four men who were threatening to kidnap their female companion, don’t realize that the world isn’t all sunshine and roses. Stallone definitely is aiming his plot’s arrows at a very real, down to earth message. The world is what it is, and we can’t change that. But we have to find a way to live in it, because this is our world. For the missionaries, its about healing wounds and spreading the word of God. For Rambo, it’s being a soldier, saving the innocent and those who need him. This message isn’t spelled out in concrete, and like in all of Stallone’s films, you have to put the pieces together yourself. In true Rambo fashion, John barely talks in the movie, but the journey he goes on as a character (finding his true self) is apparent in his facial expressions and mannerisms. Stallone is a phenomenal actor, plain and simple. The bloodshed this film shows (most of it is extremely graphic) just goes to support the message. Oh yes, be warned, there will be blood in this film. And guts, and brains, and limbs flying all over the place. But that’s war. That’s the message of the film. The gore is real and right in your face for a reason. And even if you don’t have the stomach for it, the action scenes are, as we’ve come to expect from this series, spectacular. There’s a great stealth scene, much like the scene in Rambo 2 where he attempts to save the POW’s. There’s some phenomenal jungle chases, and a final battle that sends this series out with a bang. One thing that makes these action scenes so thrilling is that the effects are done practically. I’m sure an exploding head needed some CGI work, but most of it was obviously done on set, and that makes it all the more realistic. Like other 80’s reboots (Live Free or Die Hard) or recent action movies that hark back to that time period (The Bourne Ultimatum) this is all real. I’m totally digging the action genre FINALLY getting back to real effects; CGI was getting on my nerves. And hopefully, Rambo will give audiences enough thrills with real effects to wean them off CGI, at least until the next Transformers or Spider-Man. Stallone understands how to make a good action film. The recipe is one part giant firefights, one part stealth thrills, and one part real human drama. First Blood had the stealth thrills and tons of drama, while Part II had giant firefights and stealth thrills. I don’t know what Rambo III was trying to do, but Rambo has all three parts in equal measures, and it makes for quite the ride. Stallone, you’re a genius. With all the eighties revival films being released, he’s still the King, and Rambo firmly cements that. Other notable aspect of this film include the phenomenal cinematography, and of special notice, the rousing musical score by Brian Tyler. The previous three installments were scored by legendary composer Jerry Goldsmith, but he died a few years ago. I was worried the new movie would be lacking something without his involvement, but Tyler does a fantastic job. He used Goldsmith’s themes, and imitates the composer’s style, but also brings something much more modern to the table, keeping with some themes of the film. Well done indeed. Overall, Rambo is a triumph. It’s certainly the deepest of the sequels, (especially with the brilliant ending that brings the series full circle) and harkens back to First Blood. Still, I can’t get over how bad this title is. I’m trying to talk about the character and the title of the film, and they’re the same word. It makes it hard trying to write a review. Oh well. The important thing here is that this is a powerful, provocative, and thrilling action flick. Once again, I’m surprised a movie this good is being released in January. A pleasant surprise indeed. Rambo gets my high recommendation.